It's Friday of back to school week in these parts. Oh, what a summer it was. It felt fast and furious. A hustle and bustle of some planned and LOTS of unplanned activity. Days that required little more of the kids than to venture outside to draw chalk murals on the sidewalk, or wait for one of the neighbor kids to invite them to play (or better yet, swim in their big-people pools! Our backyard is so small that we can only fit one of these unsightly blue blow-up pools that wiggle like a bowl full of jello every time the kids splash around in it!). 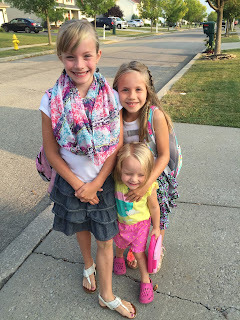 There is some gladness in the back to school rhythm. It's fun to don shiny new aqua blue sneakers to gym class (shoes with actual shoelaces to tie in Ella's case! ), and see old friends. It is fun to use new crayons, and sharpen pencils with the anticipation of using them in crisp writing journals and new math workbooks. It has been fun to meet new teachers, and swing by to say hello to the old, being grateful for familiar faces, yet very aware of a new level of maturity: that each child has graduated to the next phase, stage, classroom of life. "Mom," my 1st grader said, "I saw the kindergarteners today and they looked so small! Was I that small?" "Yes, honey," I say with a smile. "Yes you were." "Wow!" She says as I pull up a picture still on my i-phone from the first day of school last year. "Yeah mom," my third grader chimes in, "I felt so old today!" I smile again and nod my head. She is "old" by her standards...the oldest in her elementary school now (which only goes up to third grade). 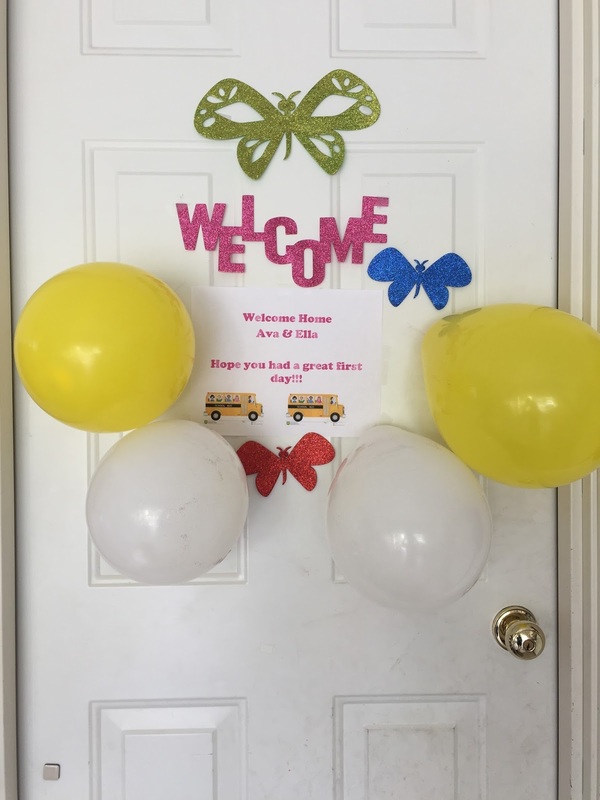 I was a total cheeseball and decorated the door from our garage into the mudroom with a "Welcome Home" sign and balloons. 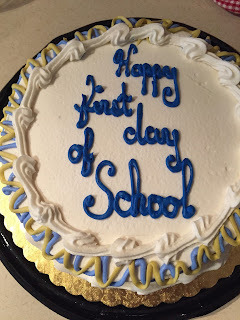 We also had a cake (purchased from Wegmans) that said "Happy First Day of School" for dessert. I did find myself apologizing to the girls for my cheesiness. Are they too old for this? I thought momentarily. But their smiles at my cheesy door and cake efforts reaffirmed my silly intentions to try to make the first day of school fun and celebratory, rather than something sad or disappointing. "We love it mom," they said. So...the structure is a welcome break from the sometimes too unstructured days (for mommy anyways!) of summer. I hate to say it, but it's nice to clean up the kitchen after breakfast and know that it will not be trashed again in 45 minutes. I can also say our house is finally a itsy, bitsy, bit cleaner as a whole...which feels very good! Summer days can leave me feeling like a hurricane blew through the house for 12 hours straight. I'm then often left to pull the pieces back together at night before the wind starts blowing furiously all over again the next day. I do, however, miss the connection and time with the kids (when they weren't driving my bonkers!). When they come home at the end of the day it always feels strange to ask them what they've done for the last six hours and get a 60-90 second answer that feels like the smallest sliver of insight into their whole day experience. Tell me more! Tell me more! I want to know everything, I want to demand. And while there was much we did, there was also much we didn't do. Unfulfilled intentions seems to linger all around the house as I clean up from the summer fun. There were books I wanted to read with them, and crafts I wanted to do. I pulled their memory books out that have been collecting dust all year with intentions of working on them together-- somehow many of these things never happened. I think mostly, while I wanted to "read" or work on memory books, what I really wanted were moments to sit and connect. Moments that felt fewer than what I had hoped for at the end of June when summer vacation was budding with expectation. I found, with a two-year old on the scene, that it is very hard to focus on...well, anything. I'd start something with the big girls and Aubrey would, naturally, start ripping pages, or pouring glue, or let the hamster out of the cage...again. In the end, I mostly tried to keep her out of trouble, or out of her sisters' hair, while they worked on games or projects and played with friends. 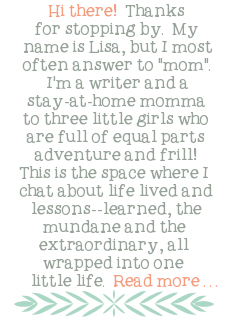 It's part of three-child dynamics that I'm still adjusting too... I did plan some big girls breakfasts, and tried to do some one-on-one bike rides, or moments together in a quiet spot on the couch. Often it's a divide and conquer mentality...one parent is "on" Aubrey, while the other does something with the older girls (again, older mommas! insight here would be great!!! LOL!). So anyways, the swing of things looks like lunch boxes back on the counter and copious amounts of paper coming home from school! It's mommy trying to figure out who likes peanut butter and who likes ham, and why the heck the Pirate's Booty that I packed yesterday morning is littered like confetti all over the inside of my oldest daughter's lunch box. This morning, after all the kids were off to school (and Aubrey was settled into playschool for the morning), I had a chance to sweep the kitchen floor, vacuum the rug and put some laundry away. And Wow! Can I just tell you? 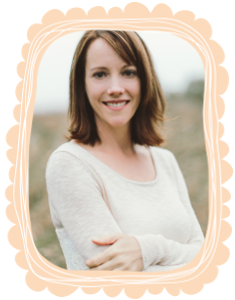 I felt like I had dislodged a popcorn kernel that had been stuck in my teeth for days! It was such a relief to clean something up without simultaneously anticipating the next mess that was going to go down! We're looking forward to a warm weekend with the kids at home. While September marks the beginning of a new school year, it also marks the beginning of cooler weather and shorter days (bah! )...so, we're making the most of the warmth while it lasts! Blessings to you in all of your own back to school, getting-into-the-swing-of-things adventures. I loved your ideas. My boys just started school today and I really thought I wouldn't cry and here you have me crying because they are growing up so fast. 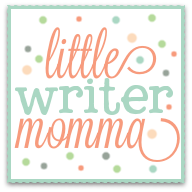 thank you for sharing your ideas on line and the scripture at the end was perfect! may God bless you!